BRUSSELS (Reuters) - Europe's chief executive said on Thursday he was "not very optimistic" about Britain's chances of leaving the European Union with a deal, also warning that any failure to agree an orderly Brexit deal will be economically costly. "If no deal were to happen, and I cannot exclude this, this would have terrible economic and social consequences in Britain and on the continent, so my efforts are oriented in a way that the worst can be avoided. 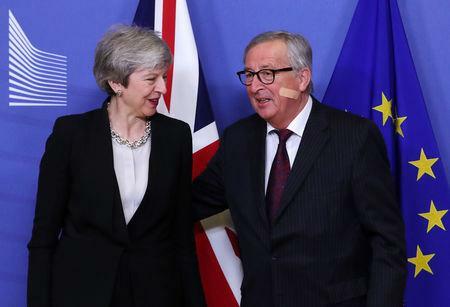 But I am not very optimistic when it comes to this issue," said Commission President Jean-Claude Juncker, who met British Prime Minister Theresa May in Brussels on Wednesday. "Because in the British parliament every time they are voting, there is a majority against something, there is no majority in favour of something," he told a plenary session of the European Economic and Social Committee (EESC).